Arriving in Jerusalem by road from Amman proved a fitting introduction to Jack Persekian and Nina Möntmann’s The Jerusalem Syndrome, presented at various locations within the Old City of Jerusalem this past October. Occupation and displacement, coexistence and conflict, borders and scrupulously demarcated territories — all integral to the experience of travelling between Palestine and Israel — formed the stuff of this fluid and aptly titled project. 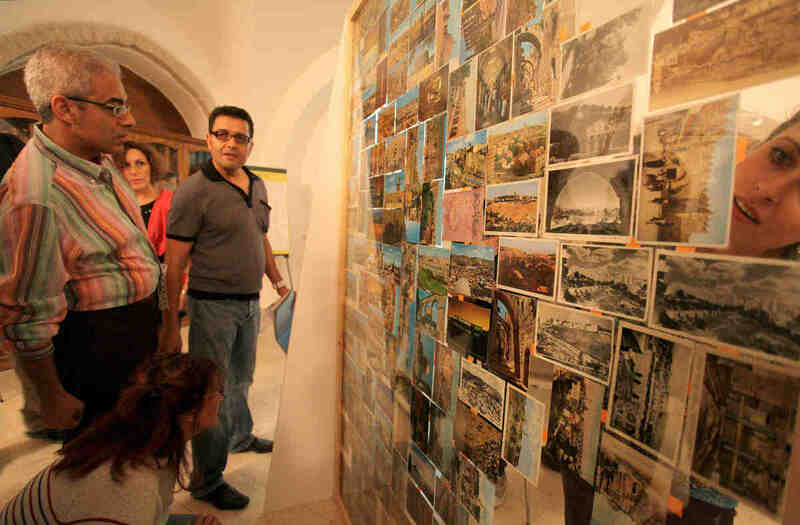 Artwork, interventions, poetry, and film by thirty artists were presented over ten days in venues including the Al-Ma’mal Foundation in the calmly elegant Armenian Quarter; the Austrian Hospice; the Swedish Christian Study Centre; Padico; and the streets, cafes, and stores of the city’s Christian Quarter. 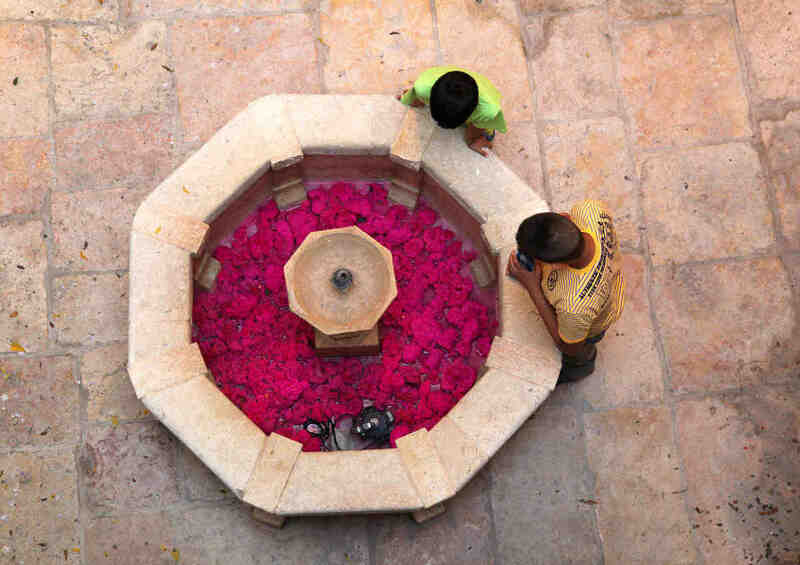 A film program, curated by Rasha Salti of ArteEast, was shown in the Jerusalem Hotel, outside the gates of the Old City. Characteristic of the collaborative spirit of the project and of the interlinked ecology of artistic and cultural activism that has developed in the Palestinian Territories over the past decade, The Jerusalem Syndrome also coincided and interconnected with the 3rd Riwaq Biennale, A Geography: 50 Villages, under the artistic directorship of Khalil Rabah, and the exhibition The Other Shadow of the City, curated by Samar Martha of the organization ArtSchool Palestine. Anyone visiting Jerusalem for the first time is likely to find the intensity and density of religious tourism in the walled city hallucinatory. Umbrella-wielding tour guides lead caravans of people who rent wooden crosses to carry along the Via Dolorosa, as they cross paths with a mix of prayerful and curious visitors to the Western Wall, located beneath the long wooden footbridge that leads to the Al-Aqsa Mosque and the Dome of the Rock. Visible waves of religious fervor wash over and also subtend the undeniable tension of a city that is both symbol and enactment of the Israeli-Palestinian conflict, in which the control of movement, high-level security interventions, and an ever-present, simmering violence is part of its essential fabric. For this most recent manifestation, Möntmann, curator and author of Art and Its Institutions (Black Dog Publishing, 2006) and the editor of New Communities (Public/PowerPlant Toronto, 2009), teamed up with Persekian, and together they invited artists from Palestine and abroad to exhibit amidst the tense spatial politics of the city and its inhabitants. Comprising new commissions as well as existing works, many by artists whose work is still little known in a broader international arena, the very nature of The Jerusalem Syndrome, in terms of specificity of place and the urban scale of presentation, meant that every encounter held an acute and resounding charge. In contrast to the theatrical rhetoric of large-scale international exhibitions, biennial or otherwise, organized in cities around the globe, the modestly scaled presentation of works and interventions in The Jerusalem Syndrome reflected an awareness on the part of the curators and artists of the impossibility of competing with the spectacle of the city itself and its complex meshing of history, religion, and politics. Encounters were poetically pointed, if not fleeting, as one was obliged to walk through the divided geography of the city and its streets and discover its buildings. Jumana Emil Abboud’s photographic collaboration with Jack Persekian, Jack’s Chairs and Jumana’s Gone to Pray, interrupted the rambling foyer and staircases of the Imperial Hotel at the Jaffa Gate. Other works encouraged a form of observational spatial drifting. Maider López’s postcard texts directed their recipients to follow a set of guidelines, such as walking straight and changing direction only when coming across “someone dressed in red,” “someone smoking,” “someone wearing glasses.” Jerusalem-based Raouf Haj-Yahia’s Gaza-Express, a series of small-format, color inkjet photographs of traditional Palestinian flatbreads being prepared for shipping via FedEx or stuffed into foil containers normally used for vacuum-packing medicine capsules. The work offered a subtle yet dark-edged response to the Gaza crisis and the subordination of human rights to politics and the technologies of representation. Installed at various locations — behind the counter of a local bakery, in a small kebab restaurant close to the thronging pilgrimage routes, and in the front window of a pharmacy by the bustling Damascus Gate — Haj-Yahia’s interventions also provoked critical questions about spectatorship and situations in which direct communicability is an urgent necessity. The use of metaphor, abundantly present, was also poignantly expressed in Samira Badran’s photographs of mannequins in varying degrees of repair and disrepair in Ramallah shop fronts, hung in the convent-like corridors of the Austrian Hospice. Testimony and acts of simple documentation were also evident, as in New York–based Palestinian-Iranian duo Ayreen Anastas and Rene Gabri’s compellingly simple multiscreen work What Everybody Knows, based on footage and interviews shot on sixteen trips to Palestine and Israel several years preceding. The artists presented, in resonant tandem to the latest episodes of this ongoing project, Case sensitive America, a narrated video meditation on Guantanamo Bay and the pervading limitations on human rights and basic freedoms that underpin contemporary life. Installations by Sandi Hilal, Alessandro Petti, Basel Abbas, Ruanne Abou-Rahme, Jumana Abboud, and CAMP, over the three floors of the elegantly restored medieval spaces of the Padico building, offered a set of environments drawing on the evocation of memory and the pathology of occupation and surveillance. While sitting to rest on the sides of the empty stone fountain of the building’s ground floor, one’s senses were gradually alerted to the pungent smells of Abboud’s pickled cauliflowers bathed in an almost phosphorescent pink vinegar at the base of the fountain. From below arose the haunting sounds of Hilal, Petti, Abbas, and Abou-Rahme’s Ramallah Syndrome, which premiered in the Palestinian Pavilion in Venice earlier in the year; its installation here in the cool damp of the underground cellar, with its floor covered in desert sand, provided a heightened psychological and physical intensity, its immersive field offering a powerful expression of the pathology of occupation. It is to the curators’ credit, and without doubt to Jerusalem-born Persekian’s knowledge of the city and its rhythms, that The Jerusalem Syndrome unfolded, for the most part, after daily activities had largely ceased. Venues were open between 6 and 9pm, after the heat of the day and the oppressive throng of pilgrims and tourists had disappeared and the narrow, stone-paved streets took on an altogether different tempo, as dusk turned to echoing night. Among the programmed performances taking place each evening was a breathtaking reading by New York–based Palestinian poet Suheir Hammad, her words delivered in hip-hop cadence. True to the tone and pace of The Jerusalem Syndrome overall, the experience was bittersweet in the exquisite dignity of hope amidst frustration, loss, and a deep-seated despair. For anyone looking for a thought-provoking consideration of the place of art within a world fraught by conflict, this was a finely pitched and richly layered beginning.